Alain-Guy Sipowo join JiC for this post on the need to address economic crimes and injustice in the Central African Republic. Alain-Guy is Social Science and Humanities Research Council fellow at the McGill Centre on Human Rights and Legal Pluralism. The resurgence of armed violence in Central African Republic (CAR) since the end of September 2015 came as a reminder to the international community that the conflict in that country is far from over. Yet, this new escalation comes after a period of relative calm. It has been announced that general elections will take place on 18 October and 22 November 2015. The recent uptick in violence thus raises serious concerns. But one cannot understand the CAR’s conflict if we do not also understand the war economy that feeds it. As such, any successful transitional justice process in the CAR must address economic crimes and the cycle of violence they fuel. We are currently witnessing what I would call the “Congolization” of the CAR – that the situation in CAR is looking more and more like the one in which the Democratic Republic of Congo has been trapped for decades: a vast country, heavily endowed with natural resources but whose governance is characterized by patrimonialization, the perpetuation of economic inequalities, and the strong ethnicization of politics. In this context, where the livid populations are neglected, citizen allegiance gradually slipped from the state to closer identity constructions such as the ethnic, religious, or armed groups. The intercommunal wars take precedence over the war against the central government, which is essentially nonexistent. Within this logic of violence, control over natural resources becomes synonymous to survival. The report of the December 2014 Security Council Panel of Experts is scathing in its indictment of the place of the trafficking of natural resources in the CAR conflict. In May 2013, the country was suspended from the Kimberley Process. The year after, however, the Kimberley Process itself made the bitter observation that its earlier decision was ineffective, noting “cases of international shipment of diamonds of CAR origin”. According to the report of the Panel of Experts, since the exclusion of CAR from the Kimberley Process, 140,000 carats of diamonds totalizing US $ 24,000,000 clandestinely left the CAR, taking the road of Kinshasa and Dubai to meet up partly in a Belgian company. Rebel groups are involved in the illegal trade of diamonds both directly or indirectly. The Anti-Balaka conduct artisanal production in the west of the CAR while in the east, members of the ex-Seleka armed group secure a financial windfall by protecting and taxing diamond collectors. The traffic of gold, another important determinant of the CAR’s wealth, follows the same pattern. 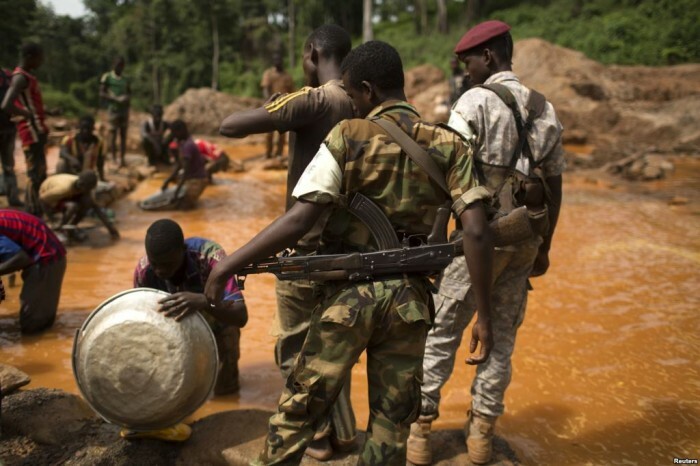 After chasing the usual gold collectors, Anti-Balaka have taken over the mines of Lobaye since January 2014. In the prefecture of Ouaka, ex-Seleka militiamen receive $150,000 a year of the local production, which approximates 180 kg. In July 2015, Global Witness pointed to the complicity of Lebanese, French and Chinese logging companies in the crimes committed by CAR’s armed groups. Under Michel Djotodia, these companies would have been entitled to pursue their activities only by making payments to ex-Seleka totaling €3.4 million for protection services. In 2014, the anti-Balaka benefited the same system, albeit to a lesser extent. How does this contribute to the economy of war? In its report, Global Witness confirmed that looted resources enable armed groups to maintain their forces and acquire weapons. The UN Panel of experts was more reserved, affirming no breach of arms embargo by armed groups. However, the panel did stress that it had identified the presence of western mercenaries providing training and assistance to armed groups. The situation described seems to be an iceberg of a much deeper scourge, one in which the CAR has repeatedly broken down under successive regimes. A Crisis Group report of June 2014 describes with meticulous detail how the country is trapped in the collapse of the formal economy to the benefit of illegal and parallel economy. In this light, a dose of economic justice must be introduced into the transitional justice process already underway. The situation in CAR was referred to the ICC in 2005. To date, only one case has been selected, which concerned a Congolese accused of crimes resulting from the support of his armed group to former President Ange-Félix Patassé. The current Prosecutor announced the opening of a second investigation on 24 September 2014. So far, no other alleged perpetrators have been indicted. Notably, in neighbouring DRC, the ICC did not address the economic dimension of the crimes it has investigated. This makes the role of the CAR’s Special Criminal Court even more vital. Financing of armed groups responsible for mass atrocities is generally considered a form of participation in the commission of international crimes, which can incur charges of aiding and abetting. This was the verdict, for example, handed down by the Special Court of Sierra Leone to Charles Taylor. But even this approach does not sufficiently recognize the importance of economic crimes in armed conflict. These crimes must be considered as such for the simple reason that they are the main cause of the escalation of violence that engenders war crimes and other crimes against humanity. The accessory liability sends the message that those who finance the conflict carry some form of lower responsibility. The fact that the jurisdiction of the Special Criminal Court is focused solely on those crimes within the jurisdiction of the ICC is a missed opportunity. For a number of reasons, it is entirely possible to address economic crimes as such. First, the Special Criminal Court is to try the crimes, which the ICC is not likely to be seized of. Second, the Special Criminal Court will apply CAR’s domestic law. As a result, it was the occasion to confer jurisdiction to this Court over national or transnational crimes such as corruption and illegal exploitation of natural resources. Finally, the Special Criminal Court deserves to be complementary to the future criminal division of the African Court of Human and Peoples’ Rights, which is endowed with jurisdiction over illegal exploitation of natural resources. The current situation demonstrates a trivialization of a core driver of violence in the CAR. Surprisingly, the Kimberley Process decided in July 2015 to lift the suspension of CAR, which can export its diamonds again. It is obvious who will benefit such a decision in a country where the state exists only in the capital. Ironically, the State survives in this place thanks to French forces whose withdrawal process unfortunately coincides with the return of violence. Are the facts giving reason to Michel Djotodia, who power by a coup in 2013 and who, at the time of his fall declared that even an angel coming from heaven couldn’t save the CAR? I believe this angel does not need to come from so far if the international community could act decisively to end impunity in this country. And efforts to end impunity must also include the entire system of economic crimes, which deprives the population of full enjoyment of their basic economic, social and cultural rights. This entry was posted in Central African Republic (CAR), Economics of Conflict, Guest Posts, Special Criminal Court. Bookmark the permalink.